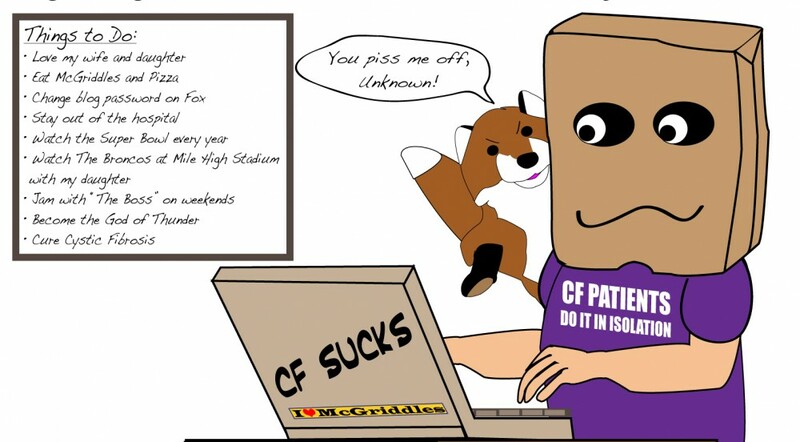 This entry was posted in cystic fibrosis and tagged cystic fibrosis, Hemoptysis by unknowncystic. Bookmark the permalink. I’ll be keeping you and your Broncos in my thoughts. No blood for you, a win for them. I’m on it. Sorry about the bleed. Hope all’s good now and stays that way. Remember that last Broncos Super Bowl well. My poor Falcons only trip there and it was over by half time. I’ll wear my Falcons shirt Sunday and that should help the Broncos win. Think you should paint the sack over your head orange and blue and post a picture. A painted face and orange hair underneath wouldn’t hurt either. Sorry about the bleed. Hope all is still well now. I remember that last Broncos SB quite well. All over for my Falcons in the first half. In memory of it, I will wear my Falcons shirt in support. 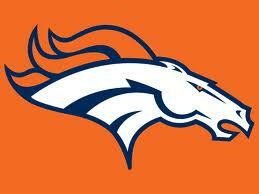 Broncos will surely win. Think you should paint a blue and orange Bronco on that bag with your face painted and orange hair underneath…or…just wear those same clothes you haven’t washed since the playoffs. Either of those should help them win. Stay well and enjoy the game.